Attendance at this meeting is crucial in that we are at a stalemate in negotiating the Memorandum of Agreement. Please note, only Librarians are required to attend this meeting. The Bargaining Committee met with Management on January 11th and 21st. We have identified many Articles in the Collective Agreement that both parties agree to, and are working towards agreement on the remaining Articles. Three dates have been set for additional Bargaining in February. Committee Members cannot discuss details of the Bargaining sessions. Once a Memorandum of Agreement (MOA) has been reached, we will have a Special Union Meeting for Librarians to present and discuss the details. Librarian Union Members will then vote on the MOA. We thank you for your patience during this transition. If you have any questions or concerns, please contact a Member of the Executive. 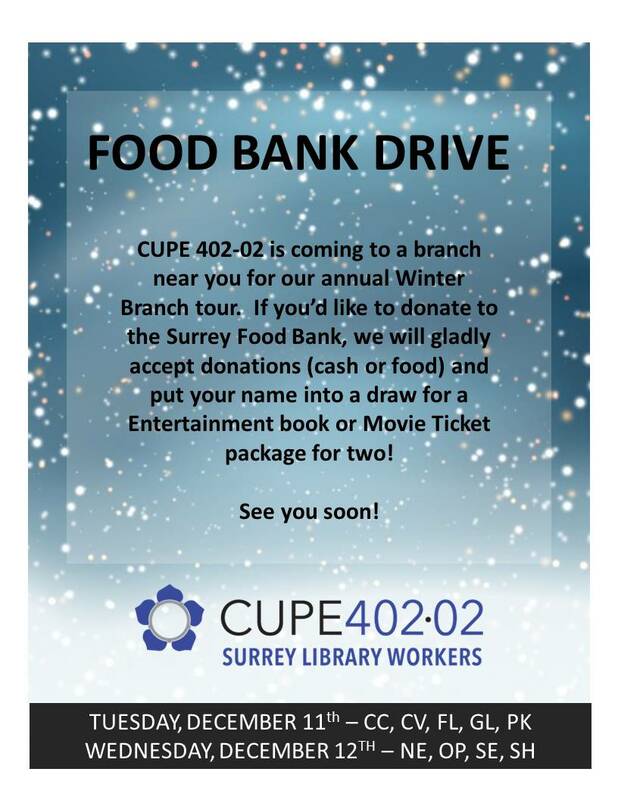 Denise, Eileen and Sung collected about 150 lbs of food and $400 for the Surrey Food Bank! Thank you everyone for your generous donations! Also, please join the executive in congratulating Natasha (OP) and Renee (SE) who were the lucky winners of the Entertainment Book and the movie tickets!